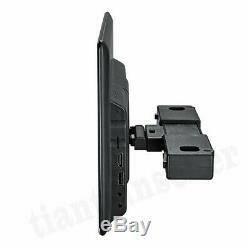 12.5 Android 6.0 Car Headrest Rear Seat Monitor WiFi FM HDMI OBD TPMS HD 1080P. We keep our operation system the latest version in the market with NEW technologies and features. Voice, Google Map, Google play, and millions of APPs suitable for car and driving. It's not only a car entertainment, but also a fully completed in-car system. 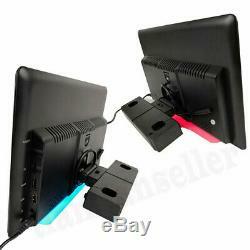 12.5 inch Color TFT LCD with Touch Screen. Screen is never like that crystal clean in-car head unit. Rt HD resolution video playback. With amazing color contract and best performance of response time. No matter for HD movie, or HD camera in, you will have awesome experience with it. 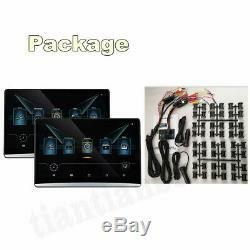 Euqipped with full crystal clean galss and intergrated TFT touch control and control key pad. It's Hi-Sensitive Touch screen for controlling the whole system. With Built-in 7 colors LED backlight , you can select turn on/off to get the color illumination, It lights up your colorful life! Unit already has Built-in WIFI receiver for INTERNET connection. Anytime and anywhere you are connected! BUILT-IN BLUE TOOTH FOR MUSIC/CALLS. PLUG&PLAY USB TF/MICRO SD SLOT. We design a special full touch screen that is built in front Mini SD slot, front rear, you will find normal USB2.0 slot interface for media and expandable devices plug&play front TF/Mini SD card for navigation, music. It's so convenient for drivers to connect and control everything! 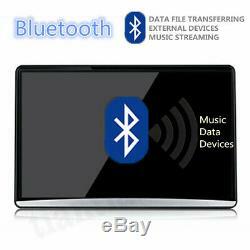 It comes with power CODEC that can read and playback all kinds of Media Files from USB/MiniSD and from Internet Streaming in HD format. There's a very important function called Mirror function. Unit links to you mobile devices. It's such a convenient way! Unit built in Google play store with numerous Apps for you to download It's not only a unit, but unlimited possibilities! Enjoy your driving time with this unit. Gle Android Language system, support worldwide language menu. 2x5WATTS MAX POWER WITH DSP. Unit Equipped with 2x20Watts Max power to drive the speaks. It gives you unbelievable endless sound power! More that that, Its the advance built-in Sound DSP (digital Signal Processor)! 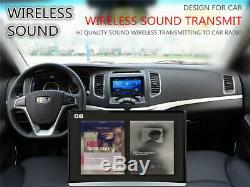 The hi-speed processor provides you best controlling of your sound in car. With the USB type dongle, you can put your 3G/4G data SIM card in it, and the unit can get connection independently. It's an Internet connection gateway. 3G/4G dongle is NOT included in standard pack. The OBD II wireless box provides you the automatic diagnosis function. You can check you car all the time-to see whether it's in a good status or need to be fixed. OBDII enginer scanner is not included. ADJUSTABLE REAR SEAT MOUNTING STRUCTURE. Cial Mounting design, its specially for Car Rear Seat Entertainment, You can adjust the viewing Angel, Up and down, forward and backward. The Most Important is, you dont need complaicated wired connection, you can DIY installation in 5mins without any wiring connection. 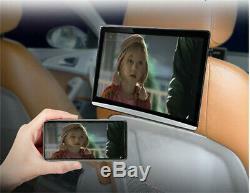 1.12.5 inch 19201080 HD IPS touch screen. 3.64-bits Android os, 2G RAM, processing powerful and smoothly. 5.8GB ROM storage, storage extension: max 128G storage USB and TF card. Built-in WLMA wireless Internet access, supports android APK. 8.200 car logo and 20 brand car UI for choice. Universal design suitable for all cars. Smoothly play 4K / 1080P video. AV input: supports link to car host or digital TV. 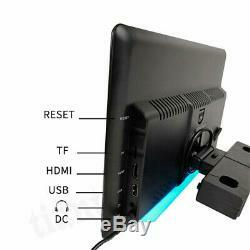 HDMI input: supports HDMI input. System: 64-bits Android 6.0. CPU: MTK8765 64-bits Android OS, quad-core cortex-a53, main frequency 1.6GHz. 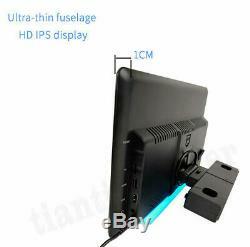 Display: 12.5 inch full HD IPS display. 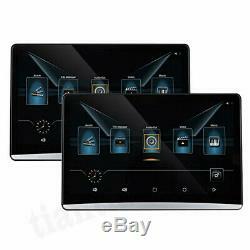 Capacitive touch screen, supports 5-point touch. 1080P multiple format video decoding, including 1080P H265 hardware decoding. Storage extension: support 128GB large capacity USB, TF card. Internet: built-in WLMA wireless Internet access. Support Internet android applications such as QQ. Video decoding performance: 1080P, 30FPS, Data rate: 30Mbps. Support audio format: MP3, AMR, WMA, CDA, WAV, MIDI, RA. Support video format: 1080 p, mp4, RMVB, rm, FLV, Avi, MPG, mpeg, MKV, asf. WMV, Mpe, 3 gp, dat, vob, ts, tp, m4v13. Support image format: JPEG, BMP, PNG, TIFF, JIF. Headphone jack: standard 3.5mm interface. Audio and video input: can connect to the car host or digital TV. HDMI input: support HDMI audio and video input. All items will be checked before packing. All items are new and of high quality. We will reply you within 24- 48 hours. The item "12.5 Android 6.0 Car Headrest Rear Seat Monitor WiFi FM HDMI OBD TPMS HD 1080P" is in sale since Monday, March 4, 2019.